Need a hand finding some new music? Today’s leading Fresh iPhone App can help. MTV PUSH it’s called, and it features a new artist every week, with music, videos and information to help you get started on your next favorite band. Once you’ve found it, you can share it quickly with everyone you know, or just select groups of people, Contact manager FlickAddress. Down in the games department is Tetris-esque puzzler Async Corp., which is all about creating colored squares from other colored squares, and 3-D steampunk racer Ionocraft Racing, in which you’ll build your own vehicle as you advance through its courses. Check them all out below. Find new music quickly and easily with MTV PUSH. The app features a new artist every week, judged by MTV, introducing you to music you might not have heard before with lots of information, right at your fingertips. 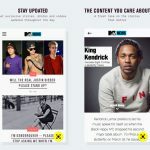 MTV PUSH provides music from each Artist of the Week, as well as video, biography information and tour dates. You get everything you need to get into something new within the app, and you can also search for previously featured artists, keep up with music blogs and get music news as well. Managing your contacts list is made highly simple with FlickAddress, which arranges your contacts in something like a virtual Rolodex. You can arrange our contacts into groups – like family, work and so on – and then flip quickly through the cards with a flick to narrow down the search for the right one. When you find the contact you need, it’s just a quick tap to start a phone call or an email. Setting up groups is as quickly as dragging one contact toward another, and you can also bookmark contacts you use frequently so they’re easier to find. Once you’ve got everything organized, FlickAddress gives you the ability to send mass messages to everyone in that group, allowing you to quickly hit everyone you work with or spread news among your family in a flash. All the cards are color-coded, as well, so you can visually identify what you’re looking for without having to spend a lot of time. Combining aspects of matching puzzlers like Bejeweled and arcade-style ones like Tetris, Async. Corp is all about making little squares into big ones. In each of its puzzle stages, you’re staring at two side-by-side grids filled with colored squares. Your goal is to make “packets” of squares that are at least 2-by-2 to create larger squares; the bigger the packets you make, the higher your score when you tap them to clear them off the grid. The only trick is that you have to switch a colored square on one side of the grid with a square on the other, and one side has to get a packet out of the arrangement. 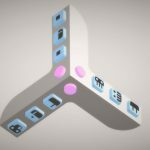 It sounds simple enough, rearranging squares to make more squares, but Async starts to get challenging as you work through its four game types. In one, your goal is to get one whole grid a single color, which means strategically switching out the squares you need without clearing your big packet. In another, speed is a factor. The goal is always the same – make a bunch of packets – but the simplicity of design and the challenge of the puzzles keeps Async Corp. interesting for quite a while. Build your own steampunk racer and blast through dystopian cities in Ionocraft Racing. The 3-D racing game has you tackling various tracks, trying to log the fastest times you can. 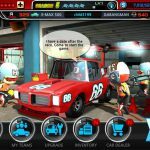 As you place better and better in each race, you’ll earn money and new parts for your vehicle, which you’ll have to place in different places on the vehicle for best performance. Tweaking your vehicle can really affect the way it performs, so messing around with customization is the key to doing well. Scores are tracked on Game Center, which allows you to take on the times of your friends and rivals on multiple different maps, and you can backtrack and replay maps with faster vehicles for better times and new improvements.